Choose Your Size Fits up to 44"Fits up to 54"
The Web Belt with Silver Closed-Face Buckle from 5ive Star Gear is made from rugged, all-cotton webbing, making it easy to clean as well as difficult to tear and fray. 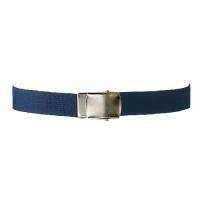 The silver metal buckle delivers convenient use and quick adjustments. Simply flip the front cover up to release the tension and release the buckle. Because it fastens through friction, it is highly adjustable and can be closed at any point along the belt's length, allowing a far more customized fit than traditional prong belts. Measuring 1.25-inches wide, 5ive Star's Web Belt is compatible with a wide range of belt-mounted pouches and accessories.